Rolling isn’t the best way to move around a sandy planet. Flying is okay, though. In today’s issue of the journal Science Robotics, Robin Murphy of Texas A&M University takes a cold look at some of the technology featured in recent Star Wars films—specifically, the BB-8 astromech droid—and, well, not to spoil everyone’s fun, but the ball-shaped bot turns out to be not very realistic. 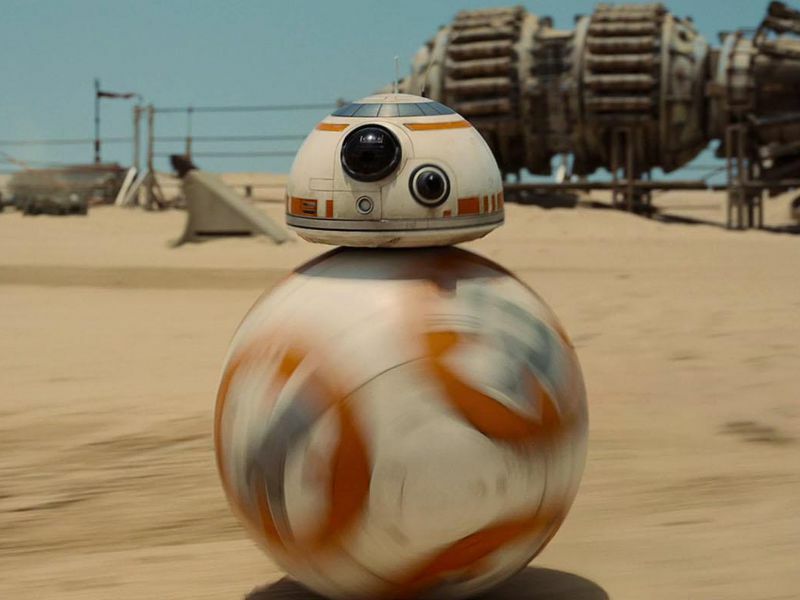 In fact, writes Murphy, when biomechanics expert Dan Goldman of Georgia Tech tried rolling a toy version of BB-8 through sand-like material, it couldn’t move at all. The feasibility of this particular droid, and even old-school R2D2, is “questionable,” concludes Wright. Ah well. Actually, NASA already knew that sandy terrain is hazardous for rolling robots, even ones with expensive, custom-built wheels. The Spirit rover eventually died on Mars after getting stuck in a sand pit in 2009, and drivers of Curiosity have to be careful to avoid terrain with slippery sand. Apart from solving these mobility problems for planetary rovers, space engineers are still trying to figure out what are the best kinds of robot sidekicks to use alongside astronauts in space. Robonaut, the humanoid helper that looks a little like Star Wars’ C3PO and has been up on the station since 2011, is coming home soon, having never quite fulfilled its potential to become a working member of the crew. One job often considered for turning over to robot helpers is photography onboard the station. Japan’s space agency JAXA recently experimented with another flying space-bot, called Int-Ball, which most of the time stayed velcroed to the wall of the Japanese Kibo lab module. Every once in a while, the astronauts brought it out to test its mobility, rotation and other basic functions. JAXA is making improvements for a future version, with a launch date to be determined. “Our final target is to accomplish zero crew time on the photography task,” says Arai. It’s not exactly charging into battle like the Star Wars robots, but it’s a start.